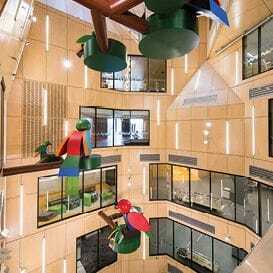 THE new 359-bed Lady Cilento Children's Hospital in Brisbane is the largest public children's hospital in Australia, bringing together highly specialised paediatric and children's health services in one location. Having won the Project of the Year award in 2014 for its work on the Gold Coast University Hospital, Lend Lease has taken out the same award this year for this construction of another highly distinguished medical facility. As the managing contractor, Lend Lease worked with Queensland Health to construct the facility, which was designed by architects Conrad Gargett in joint venture with Lyons. Based on a 'living tree', the building has two central atria, which when coupled with a series of horizontal 'branches', allows natural light to penetrate the building and helps users gain orientation in the building. These central atria are naturally ventilated spaces which contribute to the sustainability objectives, form part of the smoke management systems, and provide locations to host performances, celebrations and other events. The atria were delivered through the inventive use of temporary steel platforms to allow the atrium structures and finishes to be delivered. Inside the main atrium is a series of eye-catching birds, modelled on native Queensland Eclectus Roratus parrots. They are part of a sculpture called 'A Little Community' by Emily Floyd. The parrots weigh about 1.1 tonnes and each parrot took six hours, a mini-crane and three riggers to position into place. In addition to creating a child-focused feel to the building, the birds also help with orientation within the building. The horizontal 'branches' run off the two atria, leading to 14 viewing platforms oriented towards Brisbane landmarks. Eleven of the branches lead to specially designed rooftop gardens and terraces, incorporating 53,000 native plants, shrubs and covers. The outdoor areas have also been designed to complement rehabilitation activity; and a pet visit area on the ground floor adjacent to the George Gregan Foundation playground means that children can receive visits from their pets if they are admitted for an extended stay. The colourful facade of the Lady Cilento Children's Hospital provides shade without blocking natural light, and echoes bougainvillea in the nearby South Bank Parklands. To construct the facade, 2987 facade fins were installed using specially designed launch tables to manage the crane lifts. Innovation was at the core of delivering the complex project, located on a highly constrained site next to an operating hospital, schools, businesses, busy roads and several private residences. In addition to careful traffic management and community relations, the establishment of a remote concrete pumping station with underground pipework reticulation to the site reduced the amount of construction traffic in the busy precinct. 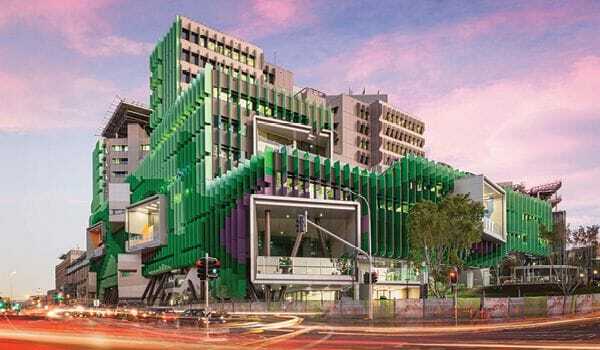 Sustainability was also high on the agenda for the Lady Cilento Children's Hospital, which among other features includes a stand-alone energy plant incorporating tri-generation technology.